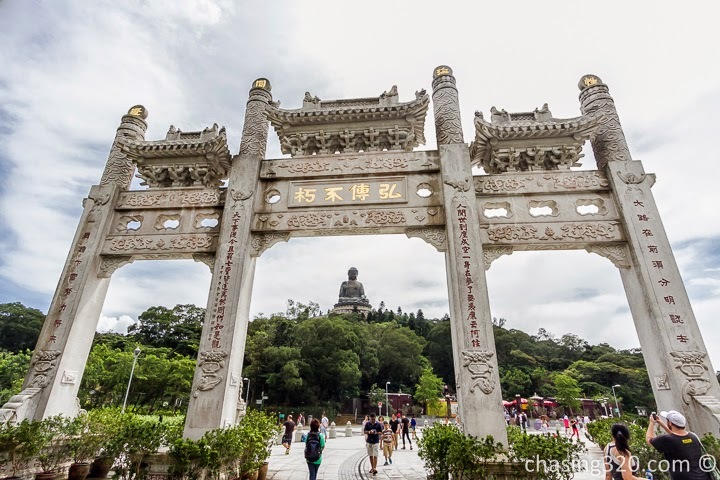 Dad and I woke up the next day and we decided that we wanted to head over to Lantau Island. A quick google maps search and we headed to the bus stop. The bus went back into the direction of Hong Kong Chek Lap Kok airport. We got down and walked the short distance to the Cable Car station. The lines to the cable car was long but moved quite quickly. We paid our fee and lined up for our cable car. The view was spectacular. As you head into the hills on Lantau Island, look back towards Hong Kong and see the beautiful airport made on or claimed land. Some 10 minutes on the ride, we can see the change in vegetation. The trees became shorter and smaller as with all vegetation at higher altitude. The fog was starting to come in. Down below, we can see hike trails. Thru the fog we went and arrived on the other side of the ride after 20 minutes. We alighted and thru a mandatory gift shop, we exited. Time to head to the Big Buddha. The weather today was sporadic. In between threat of rain were blue skies and shining sun. Dad and I started to walk up the steps to the Big Buddha. There were many steps and quite a crowd going up and down. Please be domestic extremely careful and hold on the to side rails. The fog was coming in and we could not get good photo. Occasionally, we would get lucky and the full reveal occurs. After sometime on top, it was time to head down. Most people use the right stairs to go down. And this is where I saw many slip. The steps are quite worn, some sloping slightly. With the humidity and occasional rain, the steps get slippery. The situation is not helped by algae and moss growing on some of the steps. I saw someone slide and rode some 10 steps on his back. This is a back breaker literally so please exercise extra caution especially when heading down. Hold on to the rails and go slow. As we reached the bottom, the rains started to blow in and we took shelter in a gazebo. After some 30 minutes, it was time to take a bus to Tai O. Again, Google maps came to the rescue and we found what bus to take to Tai O.